Did Cutting Corners on Cutting Trees Trigger Butte Fire Disaster? Pacific Gas & Electric Co. managers earned bigger bonuses after shifting resources away from rural tree safety efforts before the deadly Butte fire, an NBC Bay Area investigation has found. The Sept. 9, 2015 fire — blamed on the utility’s failure to cut down an at-risk tree — destroyed more than 70,000 acres and more than 500 homes, including the one Bobbie Rose and her late husband built themselves in Mokelumne Hill in 1995. At age 99, Rose is the oldest of the victims of the fire that swept through rural Amador and Calaveras counties. All she was able to salvage from the home she built from scratch with her husband were three porcelain dogs, a wedding plate and some melted jewelry. 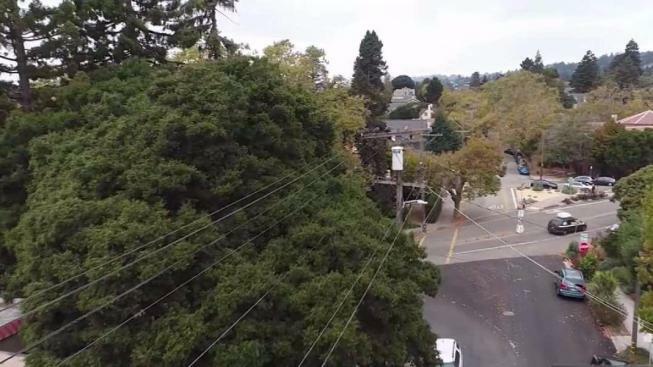 Cal Fire inspectors and investigators with the state Public Utilities Commission blame the fire that left two dead on PG&E’s failure to cut down a 44-foot tall grey pine that later slumped onto the utility’s power line. Regulators fined PG&E $8 million as a result. But our investigation found the origin of the fire may be rooted in a policy adopted years before. While the memo stresses safely cutting the “right trees,’’ it discourages employing “unnecessary safety margins.” The effort was “not about cost-cutting,” the company said, as any savings would be “re-invested” into improving overall reliability. Bill Marcus, a veteran regulatory analyst who has long studied PG&E practices, says that while improving reliability is normally a good thing, wildfire-prone areas ended up paying a price because of how the utility shifted away resources. “They essentially took money away from rural tree trimming and cut the number of trees that were being worked on in these rural areas — and that was, that’s problematic,” he said. The problem, he says, is that PG&E took money normally spent in cutting trees and patrolling rural areas and put it into reducing outages in cities, where more customers meant PG&E could maximize its chance of reaching reliability goals. “They essentially pulled it out of rural tree trimming and put it into urban reliability — so it is robbing Peter to pay Paul,” Marcus says. When economizing on tree cutting failed to generate enough money for urban efforts, the company cut tree safety patrols 25 percent in 2013, company officials acknowledge. According to a court deposition taken from Erin Parker, a vegetation management supervisor with the company, PG&E managers “weighed the options,” and decided the 2013 cut was “worth the risk.“ Parker gave her account in testimony in the legal challenged filed against the utility by Rose and other victims. The patrol reductions meant an extra $20 million to meet reliability goals, but also triggered layoffs, documents show. Then, a new, relatively inexperienced inspector hired later misjudged the risk of that 44-foot tall Grey pine. Without using the measuring gauges, the contract inspector recalled in her deposition that she figured the tree was about 35 feet high and about a foot thick near its base. In fact, the actual tree was nine feet higher — tall enough to strike nearby lines as it later leaned on them — and about half as thick as the inspector estimated. She compounded the risk, experts say, when she ordered two more robust trees on either side of the spindly tree to be cut down as of October of 2014. The following summer, three newly hired inspectors trained to find dead trees did not see any problems in that area. But as of late July, the tree was leaning dangerously according to aerial images generated using a high-tech, light-sensitive imaging technique. But the image was not processed until the month after the fire. Meanwhile, with the extra $20 million from rural efforts now being spent in populated areas, PG&E met its goal of having an average of less than one outage per customer per year. That meant that PG&E managers started to earn bigger bonuses, because meeting reliability targets constituted ten percent weighting in the state-approved executive compensation formula. PG&E did not respond to questions about bonuses or how it managed the money it gets from customers to cut and patrol trees in the state. But PG&E’s bonus practices have gotten the utility into trouble before, Marcus noted. After the August 1994 Trauner fire near Rough and Ready in Nevada County, PG&E was caught shifting $77 million from tree cutting to boost profits -- and bonuses, according to Jenny Ross, the Nevada County prosecutor who won a conviction for more 700 negligence counts against the company. PG&E also had to pay $6 million in state fines and $22 million to upgrade its program to avoid tree-caused outages and fires. Yet questionable bonus practices emerged again, this time not long before the 2010 San Bruno gas explosion. Whistleblowers complained that the company was offering unlikely bonuses to managers in charge of its gas distribution and transmission system. “They were paying bonuses if you didn’t find gas leaks, so of course, people did not find gas leaks,” said Marcus, who added that the company was forced to spend $160 million to resurvey its entire system for leaks. “Of course, that is a dangerous incentive,” said Robert Cagan, a retired Public Utilities Commission lawyer who oversaw the San Bruno regulatory case against the utility, about the gas leak bonus practice. He said the bonus, not safety, ends up driving the efforts. Meanwhile, Bobbie Rose — who was among about a dozen homeowners who recently reached undisclosed civil settlements with the company — doesn’t want to dwell on the utility’s apparent role in destroying the home she hoped to hand down to her nieces and nephews.